Our parquet block bamboo flooring has been made from strand woven bamboo, making it extremely strong and durable (over twice as hard as Oak). Parquet block flooring is very versatile and can add character and charm to any modern or more traditional space. The block of flooring have a tongue and groove fitting profile, which allows the blocks to be fitted in such a way that geometric patterns can be created. The most popular choices of patterns are herringbone, basket weave and brickbond. If you would like to find out information about bamboo flooring, how it has been made, why it is called an eco-friendly floor covering, and why it would be a great choice for your home, please have a look at our Blog where you will find useful articles. You may also like to read about the Advantages of Bamboo Flooring. 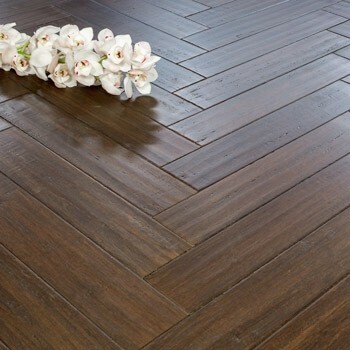 Why should I choose parquet block bamboo flooring? Our parquet block bamboo flooring is made from strand woven bamboo meaning that it is very strong and durable so it can be used in even the busiest of areas and even with underfloor heating. This particular type of bamboo flooring has been certified 100% FSC, so you can rest assured that you are helping to sustain the growth and natural habitats of the bamboo forests. If you would like to know more about how eco-friendly our bamboo flooring is, please read the following article: What is FSC certified bamboo flooring? Yes, we have range of accessories to match and complement your choice of colour and style of bamboo flooring. To complete the look of your room you will find itemsincluding: skirting boards, beading, stair nosing and thresholds. How do I look after parquet block bamboo flooring? Looking after your new parquet block bamboo flooring is easy. Like any bamboo floor, simply sweep every day with a soft brush, and then remove more stubborn stains with a cleaning spray and microfibre mop. If you would like to know more about looking after your bamboo floor, please see our Bamboo Flooring Care Guide and have a look at our Cleaning and Maintenance Productswhich have been designed and created especially for bamboo and wooden floors. Yes, if you are not sure whether parquet block bamboo flooring would suit your home, then have a look at our single plank bamboo flooring. For further advice and guidance on any of our bamboo floors, accessories or flooring related products, please contact our sales office or come and visit our showroom.